Now, Medical University of Vienna professor Leopold Eckhart and colleagues have performed one of the largest comparative genomic studies to help determine the key molecular and evolutionary origins of mammalian adaptations seen in skin proteins. In a new study appearing recently in the advanced online edition of the journal Molecular Biology and Evolution, Eckhart’s team homed in on which genes, among the dozens of mammalian keratin genes, are required for living on land or in the sea. The products of these keratin genes assemble to form the girders of the cytoskeleton in skin cells, called keratinocytes, that maintain a tight barrier between the body and the outside world. 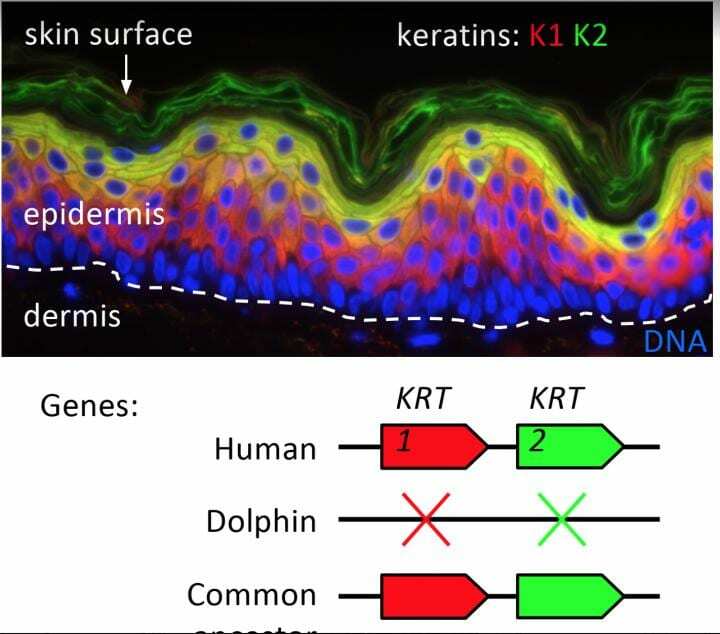 “The results of the present study provide important new data on the evolution of keratins that control the mechanical stability of the epidermis, the outermost layer of the skin,” said Eckhart. In terrestrial mammals, the epidermis depends on different keratins to maintain the barrier to the environment and to regenerate the epidermis if the skin is wounded. The new report proposes that fully aquatic mammals continuously use the epidermal regeneration program and therefore require only one of the two sets of epidermal keratins. The epidermis of dolphins is approximately 50 times thicker than normal human epidermis. Keratins K1, K2, and K10 have been lost and replaced by keratins K6 and K17 in dolphins. Both the thickening of the epidermis and the key roles of K6 and K17 are also found in human skin wound healing and in lesional skin of patients with psoriasis. In this common skin disease, so-far-unknown genetic factors predispose skin cells to trigger the evolutionarily ancient wound healing program of the epidermis. “At this point evolutionary biology meets dermatological research, and we hope that this type of ‘translational research’ will yield further insights for the benefit of patients in the future,” said Eckhart. The research team at the Medical University of Vienna also discovered previously underestimated complexity in the epidermal keratin composition due to so-called “alternative splicing” keratin K10 mRNA and adaptations of keratin gene sets in terrestrial mammals. However, an entire remodeling of the keratin cytoskeleton has occurred only in fully aquatic mammals.